Climate change risking Indonesian farmers in deciding plantation’s timeline and avoiding crop failures. Additionally, Indonesia relies on rice as a staple food, requiring more sustainable landscape and irrigated rice systems. Rice remains a priority of food crops development in Indonesia, particularly to reduce its import dependency. Many indigenous people in the country consider rice as a symbol of life, for instance, rice is a gift from the God for the natives in Ciptagelar, West Java. Farming practices in Ciptagelar follow ancestral principle. They implement non-intensive agriculture where planting cycle only takes place once a year for six months duration. The customary laws do not allow rice trading, letting the natives depend economically on other agricultural commodities. They live in simplicity, protecting the environment as they have a high appreciation towards the land and totally obey the customary law. Restriction of cultivable area, strict rules in utilizing woods and exact planting periods are some examples of cultural-based policy leading Ciptagelar to social, economic and environmental sustainability. Agricultural sector encounters challenges in maintaining the sustainability of natural resources and landscape. The warning comes from environmental, social, and economic issues at the global level. Climate change, poverty, malnutrition, hunger, land conversion, and degradation need the whole group of society teaming up to find an excellent treatment. Indonesia is one of the Asia-Pacific countries facing a devastating impact of natural resources degradation. Increase in Greenhouse Gas (GHG) emissions, in agrochemical use and in land conversion are the most actual agricultural challenges happened to the country. It is exacerbated by the switching costs of rainforest into palm-oil plantations. Changing weather patterns create more risks for Indonesian farmers in deciding plantation’s timeline and avoiding crop failures. Furthermore, being dependent on rice as a staple requires the country to encourage sustainable landscape and irrigated rice systems. The country needs a model of agricultural activities fulfilling food demand without harming biodiversity to achieve sustainable food systems. Rice, feeding the population majority (95 per cent), is a priority of Indonesia’s food crops development to reduce its import dependency. Throughout the country, many indigenous community consider rice as not only a food commodity but also as a symbol of life. For instance, the natives in Ciptagelar regarded rice as a gift from the God, it then should not be traded (Sigit, 2012). They must conduct cultivation system and cycle adjusted to the custom rules. 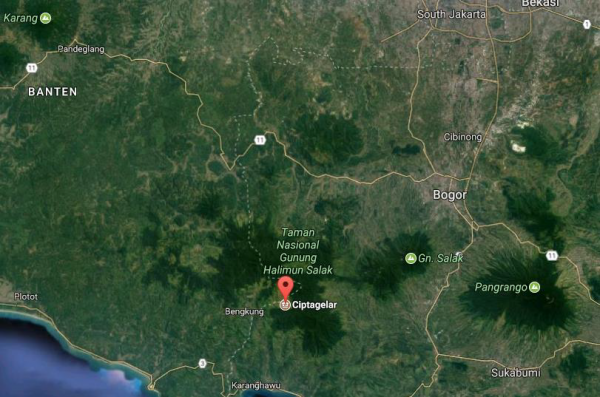 Ciptagelar is located in Cisolok Subdistrict, Sukabumi Regency, West Java, Indonesia that is also close to the Mount Halimun. There are around 16 thousand inhabitants (around 4000 households) live in Ciptagelar (Rayadie, 2017). The area has many interesting aspects of socio-culture, flora, and fauna. Mount Halimun’s forest areas accommodate small and medium groups of people forming separate villages around. The villages spread across hills and mountains in which the indigenous people named themselves Kasepuhan community. Their cultural pattern indicates the 16th-century characteristics of Sundanese (Sundanese are an ethnic group native to the West Java, Indonesia). Despite strong Sundanese culture and existing tradition, the village’s chairman of Ciptagelar (called Abah Ugi) is not reluctant to adopt innovation and modernity. The community is also well known for their receptivity towards modern knowledge and technology. They use micro-hydro turbine to electrify almost six thousand houses throughout Ciptagelar (Waras Farm, 2015). Yet during the dry season, they cannot fully depend on micro-hydro based energy as water is much more prioritized for agricultural irrigation. They have now installed solar panels as one of energy sources, provided by an international organization (Greenpeace, 2015). Farming practices in Kasepuhan Ciptagelar comply with ancestral principle and culture (ICT4agriculture, 2016). They adopt non-intensive agriculture where planting cycle only takes place once a year for six months duration. Until the upcoming cultivation year, they would leave the wetlands unplanted. The community believes that land should be restored to achieve a balance and harmonized nature without any chemical usage (Sigit, 2012). They also avoid the utilization of tractor but plough using buffalo instead (Waras Farm, 2015). The indigenous people of Kasepuhan Ciptagelar is called an agricultural community that they have been depending upon the commodities, particularly rice. Rice cultivation is not only oriented to its production but also a part of cultural life. They believe that rice has its own spirit and soul as human. Their food crops cultivation uses up around 30 per cent shares of land. The productivity rate of every patok (400m2) of land is ranging from 50 to 60 bundles of rice (Sigit, 2012). One bundle of rice amounts to three kilograms. In general, every household in Ciptagelar has small granaries. In total, they own around 8000 granaries in which the rice stockpile can suffice up to the next three years (Waras Farm, 2015). One granary is adequate for 500-1000 bundles of rice and can guarantee a year food supply of one small household (Sigit, 2012). The natives always celebrate a harvest festival to mark the new agricultural year in Sundanese ancient calendar. The ceremony, Seren Taun, has been held annually since 1368. In Sundanese language, Seren means offering and Taun means a period of 12 months (a year). The ceremony signifies their gratefulness upon rice harvest achieved in the previous year and wishes for a blossomed harvest in the coming years as well as a tribute to the ancestors (Sigit, 2012). It has made Kasepuhan Ciptagelar be one of the top visits for cultural events and natural ecosystem in West Java. Therefore, after the visit, many organizations decided to conduct their projects in Kasepuhan Ciptagelar to support the natives enhancing their livelihood through sustainable agriculture. Ciptagelar is a six-hectare village in the middle of Mount Halimun-Salak National Park. The natives live in the neck of Mount Halimun at an altitude of 1200 meters above sea level. They implement subsistent agriculture, improving livelihood while protecting the environment. The area is surrounded by rivers and springs which the natives utilize for rice fields irrigation, drinking, cooking, washing and driving the self-made micro-hydro turbine. Hence, they can generate electrical energy. Its topography constitutes a plateau with a quite extreme elevation angle, hemmed in by the steep cliffs. It explains why they apply terraces system for the rice fields (Irwansyah, 2008). Sirah Cai or springs; is considered as a source of livelihood that it should not be disrupted. Lemah Gunting or the confluence of two small rivers; is regarded as an encounter of two mystical powers. Pematangan or mound of soil; is believed as a locus of supernatural being. Leuweung Titipan is only exploitable for customary needs (e.g. to build a bridge). They normally replant the trees afterwards to displace the felled trees. Leuweung Tutupan is wildwood that should not be used for any purpose. Leuweung Garapan is the exploitable forest for citizen needs and habitation. Kasepuhan Ciptagelar has been implementing effective agricultural system wrapped with myth and custom. Once-a-year-planting leaves the pest habitation without feed for breeding hence Ciptagelar lands are safe from many kinds of pest (Sigit, 2012). No-rice-trading lets Kasepuhan Ciptagelar secured with staples. Although they do not generate income from rice, they plant vegetables and fruits through intercropping systems. It is done out of rice-planting season for commercial purposes. Some of the natives also develop coffee plantation and business as the land elevation is suitable for coffee (Waras Farm, 2015). Kasepuhan Ciptagelar adopts joint-land-tenure where the land is considered non-tradable and non-private property. In a special case, one ownership can be transferred to Kasepuhan fellow citizen with a sum of money as a compensation for land-treatment (Waras Farm, 2015). This collective system made each household not able to determine cropping calendar on their own. It is also deliberately established to enhance the sense of togetherness. Kasepuhan Ciptagelar is an evidence that balancing the customary policy, technology adoption and natural-based system can bring people in harmony with nature. The natives follow traditions that indirectly attaining social, economic and environmental sustainability. Prominent level of trust, accountability, and appreciation towards nature, people and culture are some of the driven factors leading Kasepuhan Ciptagelar to prosperity. Their multi-benefit landscape for agriculture, forestry, livelihood, and tourism shows how local wisdom wisely sorting modernity out.